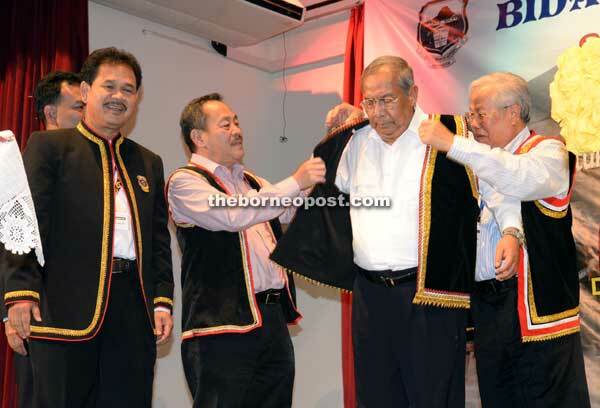 Manyin (right) and Sagah (second left) adjusting the Bidayuh traditional shirt on Adenan as Ik Pahon (left) looks on. — Photo by Jeffery Mostapa. KUCHING: Chief Minister Datuk Patinggi Tan Sri Adenan Satem yesterday indicated that Serian district will be elevated to be the 14th Division in the state. Speaking to reporters after launching a Bidayuh symposium at Dayak Bidayuh National Assocition (DBNA) headquarters here, Adenan all but confirmed the formation of a new state division when he told reporters that he would discuss with the State Secretary, Tan Sri Datuk Amar Morshidi Ghani, the administrative process of elevating Serian to a division. The exercise will involve drawing up boundary for the proposed new division and determining the size of its population. He added that the preparation to establish the new division would be similar to the exercises carried out to turn Kapit and Mukah into divisions in the past. Earlier speaking the launching of the symposium, Adenan assured that titles would be issued to untitled Bidayuh Native Customary Rights (NCR) land. He commended the initiative by DBNA to survey Bidayuh NCR land, to complement the surveys carried out by Land and Survey Department. “Those (Bidayuh) who have NCR land and without title will be issued with one (title)…no doubt about that, so I must compliment the effort by DBNA to survey the land and that must continue,” Adenan stressed. Adenan stressed that the government would never neglect minority groups but added that they must attach themselves with the majority. He lauded DBNA for organising the symposium and bringing the members of the community from different political affiliations to discuss issues affecting them. “I feel honoured to be invited to this event and able to see the community, in spite of the political differences able to come together for the sake of the Bidayuh community,” he said. The symposium was attended by more than 1, 000 participants. Present at the event were Minister of Infrastructure Development and Communication Dato Sri Michael Manyin, who is also DBNA advisor, State Legislative Assembly (DUN) deputy speaker Datuk Roland Sagah Wee Inn, Assistant Minister of Public Health Datuk Dr Jerip Susil, Assistant Minister of Community Development Datuk Peter Nansian, DBNA president Datu Ik Pahon Joyik and Bidayuh community leaders.